Fargo, GA--It was not a very good year for the swamp! 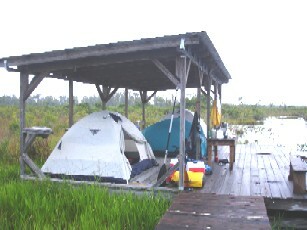 Wildfires raged for months destroying the overnight shelters at Big Water and Maul Hammock and the day-use shelter at Dinner Pond. The extended drought forced the refuge to close all of the canoe trails and led to the closing of the Suwannee Canal Recreation Area, the Okefenokee Swamp Park, and Stephen Foster State Park. Rains brought some relief but the only regular canoe trials open by early October were the single night trips from Suwannee Canal Recreation Area to the Suwannee Canal shelter and the trail from Kingfisher Landing to Bluff Lake. Mixon’s Hammock is normally not available except for groups like Boy Scouts, but the refuge did allow overnight trips from Stephen Foster to Mixon’s Hammock since almost everything else was closed. In spite of the extensive fire there was very little deep burning of the peat. 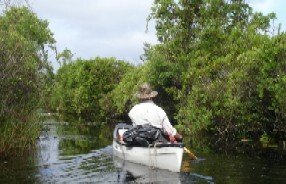 Ecologists contend that the swamp needs fire to prevent its return to dry land, but Alan Dozier of the Georgia Forestry Commission said he could not imagine a larger fire and this one seemed to do almost nothing to actually penetrate the peat. Being unable to get the traditional three day permits, the King did manage to secure a permit from Kingfisher to Bluff Lake and return for October 4 and 5, and a permit from Stephen Foster to Mixon’s Hammock and return for October 6 and 7, 2007. The Bluff Lake trip was for Thursday and Friday and only Roy Moye, Greg Baker, and Charlie Stines elected to make the paddle. All spent Wednesday night in Folkston at the Western Motel, ate supper and breakfast at the Family Restaurant, and set out for Kingfisher Landing on Thursday morning. A light rain was falling and weather forecasts indicated more on the way. The temperature was pleasant and the bugs at Kingfisher were less evident than usual. Each man loaded his own solo canoe and the paddle began just before nine. The first couple of miles were easily paddled. Greg and Roy claimed to have spotted an alliga tor at least ten feet long about the two-mile marked. Serious rain began around 10:30 but it did not last too long. After milepost three the paddlers began to understand the meaning of arduous paddling. The peat blow-ups gave the swamp the consistency of oatmeal at times and the average speed of the journey no doubt plummeted. Water lilies and bladderwort clogged the trail. There was some evidence of the fires especially in some of the shrubbery and the hardwood trees. Wildlife was surprisingly scarce except for frogs. There were a few ducks, some herons, and even a few sandhill cranes. 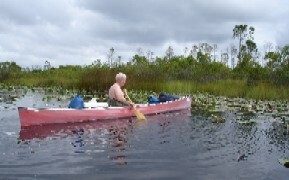 This might have been the only swamp trip where neither an ibis nor a vulture appeared in sight. The green trail has no dry land between Kingfisher Landing and Bluff Lake. It does pass through Flag Lake and Durdin Lake before the trail reaches Bluff Lake. Roy, Greg, and Charlie took a break about the seven-mile marker and then proceeded on to the shelter. 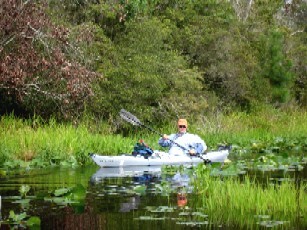 Bluff Lake is one of the larger and prettier lakes in the swamp, The shelter is reached by crossing the lake and heading down a narrow canal. The shelter was in good repair. Once it was reached the downpour began. The three men sat under the shelter eating lunches and hoping for a break in the rain before erecting tents. Finally it did come and the paddlers pitched the three tents. The rains again came with a vengeance. The company was so amusing that no one really minded being stuck under the shelter. The rain finally did stop. Charlie once again proved his ineptness at fishing. Greg made supper of shrimp purlieu. Lillian sent brownies and Greg was sufficiently considerate enough not to dump them into the water this trip. Once supper was done the trio told lies and shared life adventures with one another. There was little wildlife to view but a few sandhill cranes did fly over. The chattering of frogs filled the air, and there were obviously some owls in ear range. Wild as the Okefenokee may be perceived, little of the eastern side is outside the range of the songs of the passing trains. It was a very dark night. Everyone went to bed shortly after dark, and the rains again came. By morning it was not raining. Charlie made pancakes, bacon, and coffee for breakfast. The paddle out of the swamp began just shy of nine. The return trip was much like the paddle in except in reverse. It was over before twelve. The men then went to Folkston for a Burger King lunch. 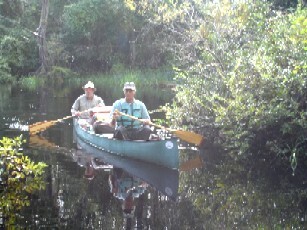 Greg headed out for St. Augustine and Roy and Charlie set out for Stephen Foster to get ready for the second and final of the October swamp trips. It rained most of the way between Folkston and Stephen Foster. Charlie and Roy entered the state park about four; George and Melissa Royal arrived al most behind them. There was little to do because it was pouring rain. Art came a little later. George, Melissa, roy, and Charlie all pitched tents in the rain. Art slept in the Mercedes. Charlie discovered that he had not brought his outfitter wing to use as a group rainfly. Cell phone service at Stephen Foster is almost non-existent. Finally the message got through for Donald to stop by Charlie’s house and bring it. The rain had ceased by morning. Jerry and Donna Ellis arrived before nine with their individual kayaks. Donald May came and did have the outerfitter wing. Melissa and George paddled the Penobscot 17, Art and Donald took the Canadienne, and Roy, Donna, Jerry, and Charlie each soloed. The paddle down Billy’s Lake to Mixon’s Hammock was done under blue skies and was accomplished in no more than forty-five minutes. Mixon’s Hammock is an island at the downstream end of Billy Lake just as the river narrows begins the trail to the sill area. It is normally not used for canoe camping except by youth gro ups but was available this year because about everything else was closed. There is a dock and a composting toilet, but there are no tables and no shelter. It is probably about a two hundred yard carry from the dock to the campsite. The trail is reminiscent of a logging tram bed and it winds through some very pretty tall grass. The campsite is cleared and is much like the camping area around the Floyd’s Island cabin. Several of the campers took a short hike and saw a large snake. Everyone thought it was a cottonmouth based on the size and coloration, but no one wanted to get close enough to examine its head or look down its throat. Most of the travelers follow the Jester’s philosophy that God did not like snakes and he did not expect us to. After pitching the wet tents and hoping the sun would dry them, the eight sat around doing little of nothing. 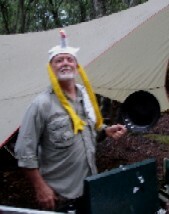 After eating the usual lunches the outfitter wing was erected. It was a good thing to have. The rains again came and the wing was large enough to shelter all eight for several hours of downpour. But finally the rain stopped. Donna and Jerry fed everyone some really great barbecue from some place called Cowboy’s. George and Melissa brought the buns, Art brought the chips and dip, and Donald brought his famous coleslaw. Almost all the barbecue was eaten. The bugs were present but not to the extent that good insect repellent did not provide all the protection necessary. The wet weather discouraged any fire-building attempts. The crew sat around under the outfitter wing telling stories by the light of a propane lantern. Owls and woodpeckers provided the noise. As darkness approached so did the raccoons. No on e is sure how many were actually there but all appeared overfed. George decided that the trash would be a prime target so he tied the bag a couple of feet above ground level to protect it from the scavengers. Finally everyone sacked out for the night. It did not rain anymore. Charlie waited until daylight to begin the coffee. Daylight revealed that the raccoons had managed to tear the bottom out of the trash bag and scatter the garbage. Someone decided that perhaps the animals were immigrants from south of the border and they had played pinata with the trash bag. Roy made grits, sausage, and egg for breakfast. The eggs were yellow and were scrambled in olive oil. Donna helped with the grits and Jerry helped with the sausage. It was a good meal and no raccoons came for second helpings. After breakfast George used his Marine skills to build enough of a fire to burn the paper trash. Once that was done, everyone began breaking camp and toting the gear to the boats. 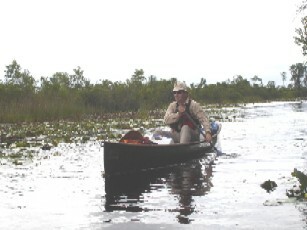 The paddlers were on the water by about 10:30 AM and had arrived back at Stephen Foster by about 11:15. 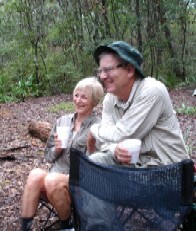 It was a good trip despite the rain and was to a place the travelers will likely never be able to go again.